Reissued, with a new foreword, for the 70th Anniversary. Antony Beevor's D-Day: The Battle for Normandy is the closest you will ever get to war - the taste, the smell, the noise and the fear. 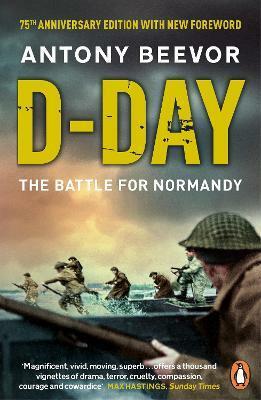 The Normandy Landings that took place on D-Day involved by far the largest invasion fleet ever known. The scale of the undertaking was simply awesome. What followed them was some of the most cunning and ferocious fighting of the war, at times as savage as anything seen on the Eastern Front. As casualties mounted, so too did the tensions between the principal commanders on both sides. Meanwhile, French civilians caught in the middle of these battlefields or under Allied bombing endured terrible suffering. Even the joys of Liberation had their darker side. Antony Beevor is the renowned author of Stalingrad, which won the Samuel Johnson Prize, the Wolfson Prize for History and the Hawthornden Prize for Literature, and Berlin, which received the first Longman-History Today Trustees' Award. His books have sold nearly four million copies. Antony Beevor is the author of Crete: The Battle and the Resistance (Runciman Prize), Stalingrad (Samuel Johnson Prize, Wolfson Prize for History and Hawthornden Prize), Berlin: The Downfall, The Battle for Spain (Premio La Vanguardia), D-Day: The Battle for Normandy (Prix Henry Malherbe and the RUSI Westminster Medal), The Second World War, Ardennes 1944 (Prix Medicis shortlist) and Arnhem. The number one bestselling historian in Britain, Beevor's books have appeared in thirty-three languages and have sold over eight million copies. A former chairman of the Society of Authors, he has received a number of honorary doctorates. He is also a visiting professor at the University of Kent and an Honorary Fellow of King's College, London. He was knighted in 2017.